On first visit to New York: "Fantastic. ... I'm hopeful I'll come back to visit again"
NEW YORK (CNN) -- As Britain's Prince Harry neared the end of his second and final day in New York City on Saturday, he described his experiences as "fantastic." 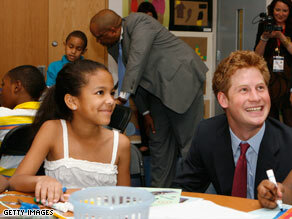 Prince Harry smiles whilte touring the Harlem Children's Zone on Saturday during a 36-hour visit to New York. The 24-year-old visited the Harlem Children's Zone, a nonprofit organization that offers free programs and classes in a low-income area, then went to Governors Island in New York Harbor to play in the Veuve Clicquot Manhattan Polo Classic. Profits from the match will benefit Sentebale, a charity for orphans in Lesotho, Africa, a cause Harry's mother, Princess Diana, had promoted. The prince was accompanied by Prince Seeiso of Lesotho, who also lost his mother when he was young. The men toured the Children's Zone with founder Geoffrey Canada, and spent time in a classroom where some students were studying for a math test. A 10-year-old girl sitting at a desk covered with drawing paper and colored markers gave Harry a picture. "Is this for me?" Harry asked as he accepted it. Pointing to the desk and pens, he then asked, "You find yourself very lucky to have all this?" When she nodded, he replied "Good." Cheering people lined the street as Harry entered the building. As he left, reporters shouted questions. Asked how he liked his first official visit overseas and meeting the children, the prince responded, "It's been fantastic -- really, really worthwhile." "It's my first visit to New York. I'm hopeful I'll come back to visit again." He also was asked whether he thought his appearances would change any image the public might have of him, apparently referring to some of his wild exploits ways when he was younger. Those incidents included a one-day stint in drug rehab in 2002 and accusations of racism in January. "I don't know what the image is of me. There is always the image that's been given to me, but people have their own opinions, it's the media that likes to stamp on the image which isn't really me." He left a handwritten note tacked to the wreath, citing an "the courage shown by the people" of New York on September 11, 2001. Harry later paid tribute to his fellow citizens at Lower Manhattan's British Garden at Hanover Square, where he honored the 67 British victims of the September 11 attacks, officials said. The third in line for the British crown, Harry is active in the British Army. He received a promotion to lieutenant in April 2008 and is currently training for an Army Air Corps pilot position, according to the prince's Web site.